The Division for Social Policy and Development (DSPD) of DESA will co-organize with the United Nations Economic Commission for Latin America and the Caribbean (UNECLAC) in Santiago de Chile, Chile, an Expert Group Meeting under the theme “Advancing the rights and perspectives of women and girls with disabilities in development and society” from 15-17 November. The meeting will invite, in their individual capacity, experts from around the world including those with experience in: disability, women’s rights, gender equality and empowerment of women, social and economic development, and research. The meeting is expected to result in a set of recommendations to support operationalization of the 2030 Agenda for Sustainable Development, and other internationally agreed goals, in a way that is inclusive of and responsive to the needs and perspectives of women and girls with disabilities. The meeting is also expected to contribute towards a Secretary-General Report on the situation of women and girls with disabilities. The recommendations from the meeting will be formulated to guide implementation of the 2030 Agenda by the international community to strengthen gender equality and the empowerment of women and girls with disabilities. It is estimated that 1 in 5 women have a disability. Women and girls with disabilities face systemic barriers to participation and inclusion and represent a disproportionate percentage of the world’s poor as a consequence of discrimination. This is especially true of women with disabilities who face multiple and intersectional discrimination. Limited available evidence points to significantly greater inequalities experienced by women and girls with disabilities compared to men and boys with disabilities. In Latin America and the Caribbean the prevalence of disability is higher among women than among men, a gap that increases with age (ECLAC, 2013). The high levels of social and economic inequality that are characteristic of the region place women and girls with disabilities (particularly those belonging to indigenous groups, are afro-descendents, or reside in rural locales) in a situation of acute marginalization and exclusion. As is the case in other regions, the double discrimination that girls and women with disabilities face in the Latin American and Caribbean region occurs in a cultural context where traditional gender norms prevail. Notable progress has been made over the past decades towards gender equality and the empowerment of women, including through gender mainstreaming. Significant advances have also been made in the promotion of the rights and perspectives of persons with disabilities. However, significant gaps remain in terms of addressing the situation of women and girls with disabilities. National laws and policies have historically neglected women and girls with disabilities. Laws and policies that focus on women and the promotion of gender equality have traditionally failed to respond to disability issues in their implementation. This historic invisibility has contributed to the multiple forms of discrimination that continue to be experienced by women with disabilities. 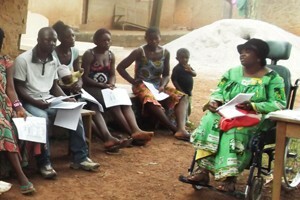 The Convention on the Elimination of All Forms of Discrimination against Women (CEDAW), which protects and promotes the rights of all women, and the Convention on the Rights of Persons with Disabilities (CRPD) promotes and protects the rights of women and girls with disabilities on an equal basis with men. Article 6 of the CRPD responds to the persistent marginalization and invisibility of women with disabilities by providing for their development and advancement and promotes measures to empower women with disabilities. It specifically singles out women with disabilities to support the strengthening of their voice, agency and confidence to act as rights holders on an equal basis with others. Globally, these Conventions have received close to universal ratification. However, while these instruments provide a regulatory framework to promote the inclusion of women with disabilities, they require public policies and effective implementation to achieve real change. Further, jurisprudence emanating from the Committee on the Elimination of Discrimination against Women, the Committee on the Rights of Persons with Disabilities, and the Committee on the Rights of the Child, provide guidance in this area. It is expected that a General Comment on Article 6 will be adopted by the Committee on the Rights of Persons with Disabilities in late 2016 and will also provide further guidance. The recent High-level Meeting on Disability and Development (HLMDD) of the General Assembly held in September 2013, further reiterated the need for strengthened efforts by governments and other stakeholders to address the multiple forms of discrimination experienced by women with disabilities, with particular attention paid to poverty eradication and social inclusion of women with disabilities. This issue has also been given particular attention during sessions of the Conference of States Parties to the CRPD. The lack of clear linkages between international normative frameworks and developmental and societal outcomes for women and girls with disabilities reflect a broad range of institutional failures to coordinate and systematically integrate and mainstream gender and disability in policies and programs. Effective mainstreaming of the spirit of the international human rights instruments and commitments of the HLMDD in national laws, policies and programmes that affect persons with disabilities and women and girls remains a persistent challenge. Similarly, the voices and perspectives of women with disabilities have largely been pushed to the sidelines in national women’s movements. Equally, the voices of women with disabilities are not always heard or amplified and are sometimes even marginalized within the mainstream disability community, both globally and in many countries. Measures to specifically address the situation of women and girls with disabilities are largely pursued in isolation or in parallel to existing mainstream policies and mechanisms. Consequently, women and girls with disabilities largely remain at the margin of the work on both gender equality and disability rights. Responding to the intersectionalities and diversity of needs and perspectives of women with disabilities calls for new forms of collaboration, coordination and sharing of expertise beyond traditional spheres. Bridges need to be constructed to break down siloed agendas. In this regard, law and programmatic reform needs to recognize and respond to the intersectionalities of gender and disability to effectively mainstream the rights and perspectives of women with disabilities into the landscape of the broader regulatory system as well as gender empowerment programmes. The 2030 Agenda for Sustainable Development offers an opportunity to advance gender-responsive and disability-inclusive development. The 2030 Agenda recognizes gender equality and disability as cross-cutting issues that are integral and indivisible in all three dimensions of sustainable development: economic, social and environmental. The SDGs demand systematic mainstreaming of a gender perspective in all Goals, with goal 5 dedicated to advancing gender equality and the empowerment of all women. Disability is specifically included in the SDGs related to education, growth and employment, inequality, accessibility of human settlements, as well as data, monitoring and accountability. Effective implementation of the 2030 Agenda therefore requires an integrated approach to gender equality, women’s empowerment, disability and development, which responds to and addresses the rights and perspectives of women with disabilities throughout. 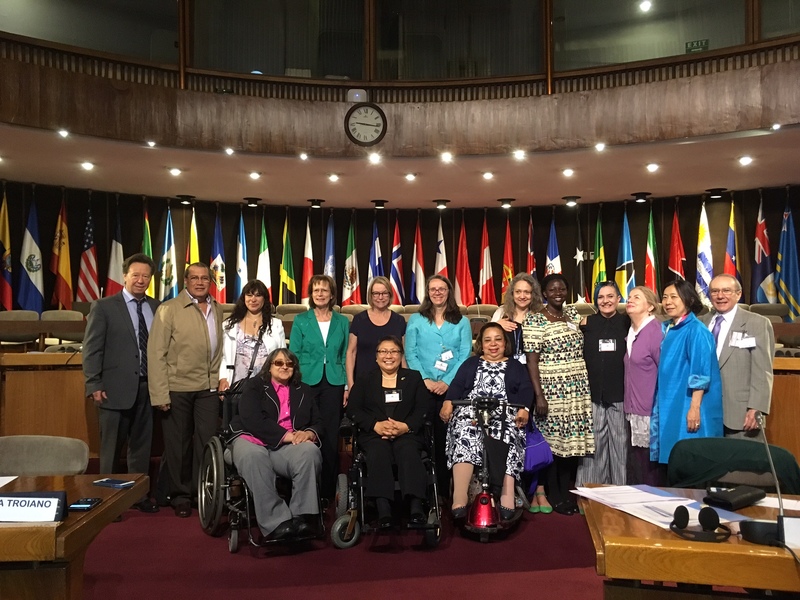 The Beijing Declaration and Platform for Action adopted at the Fourth World Conference , and agreed conclusions on “Women’s empowerment and the link to sustainable development” adopted by the Commission on the Status of Women in March 2016, also provide guidance for the adoption of integrated measures to protect and promote the rights of all women and girls with disabilities, ensuring their full and effective participation and inclusion in society, and to address the multiple and intersecting forms of discrimination they face. In consideration of the 2030 Agenda, there is a need for the international community to open a meaningful dialogue between regional and national experts and advocates to identify strategies and actions to empower women and girls with disabilities and advance their situation. This Expert Group Meeting will bring together a diverse group of experts to develop a set of recommendations for measures to promote and advance the situation of women with disabilities in development and society from global, regional and national perspectives. The outcome of the meeting will be used to inform a report of the Secretary-General on the situation of women and girls with disabilities, to be submitted to the 71st Session of the General Assembly. Identify opportunities and challenges for mainstreaming gender equality and disability in the operationalization of the 2030 Agenda for Sustainable Development in Latin America and the Caribbean: translating “leaving no one behind” into regional and national programmes and actions. The Secretariat for the Convention on the Rights of Persons with Disabilities / Division for Social Policy and Development of the United Nations Department of Economic and Social Affairs (UNDESA) in collaboration with the United Nations Economic Commission for Latin America and the Caribbean (UNECLAC) will organize the meeting at UNECLAC in Santiago de Chile, Chile on 15-17 November 2016. The experts will be identified and invited by the Division for Social Policy and Development in close collaboration with UNECLAC. In addition, representatives of international organizations, United Nations departments and agencies, as well as civil society organizations will participate. The working language of the meeting will be English. Documentation for the meeting will be provided in English. Spanish interpretation will be provided. OHCHR studies on a range of subjects concerning the rights of persons with disabilities, touching upon the situation of women and girls. As of 15 August 2016, CEDAW has 189 State Parties; CRC has 196 State Parties; and CRPD has 166 State Parties. The importance of empowering women and girls with disabilities has been emphasized in all sessions of the Conference of States Parties and was included as subthemes at the 5th and 8th Sessions of the COSP. Beijing Declaration and Platform for Action: adopted by the Fourth World Conference on Women: action for equality, development and peace, Beijing, China, 4-15 September 1995. (1995). Beijing: United Nations. The Beijing Declaration and the Platform for Action recognize disability as a barrier to full equality and advancement, and the enjoyment of human rights (paragraphs 46 and 225), and identify specific actions to ensure the empowerment of women with disabilities in various areas (paragraphs 60(a), 175(d), 280(c), 82(k), 106(c), 106(o), 124(m), 126(d), 178(f), 178(j), 195(a), 206(k), 101, 233(a), 233(b), 81(a), 278(d)).